A 21 piece tap and die set. Heat treated, hardened steel. Contents; 9 taps and 9 dies (M3-0.5mm, M4-0.7mm, M5-0.8mm, M6-1.0mm, M7-1.0mm, M8-1.25mm, M10x1.5mm, M12x1.75mm, NPT1/8x27). Tap wrench, die handle and storage case. 9 taps and 9 dies. 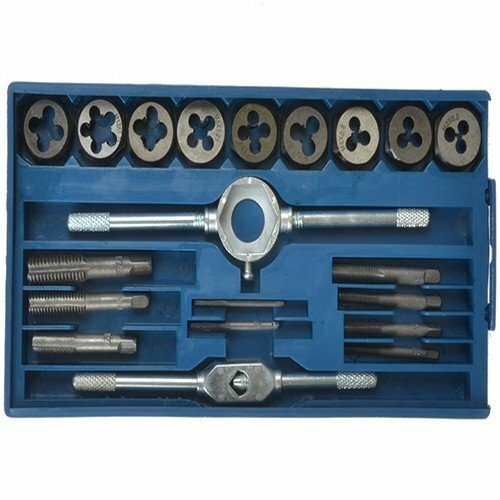 Sizes: 3 x 0.5mm, 4 x 0.7mm, 5 x 0.8mm, 6 x 1, m7 x 1.0mm, 8 x 1.25mm, 10 x 1.5mm, 12 x 1.75mm, npt 1/8 x 27, 1 tap wrench and 1 die handle. If you have any questions about this product by Blue Spot Tools, contact us by completing and submitting the form below. If you are looking for a specif part number, please include it with your message. Ridge Tool 37840 Ridgid Genuine Replacement Die 1-1/4" NPT, 0.2" x 5" x 3.5"